Wasn’t it time VR audio became an equal partner to VR video? Enter the AMBEO VR Mic: The new standard in 3D audio capture from Sennheiser lifting VR audio production to a new professional level. With the AMBEO VR Mic you are able to seamlessly record sound that immerses the listener bringing them a whole new and highly emotional experience. The elegantly designed AMBEO VR Mic has been developed in cooperation with VR content producers and fine-tuned through an extensive creators’ program with participants from across the audio and VR communities. The mic caters exactly to the needs of VR content creators, letting you capture the experience and spirit of any location enabling the listener to be immersed as if they were there. The easy-to-use AMBEO VR Mic is an ambisonic microphone fitted with four matched KE 14 capsules in a tetrahedral arrangement. This special design allows you to capture the sound that surrounds you from a single point. As a result you get fully spherical ambisonics sound to match your VR video/spherical 360 content. 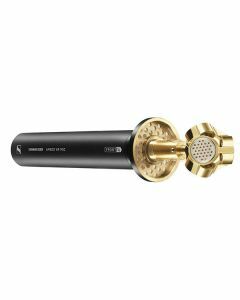 By means of the VR Creators Program Sennheiser made sure to involve the professionals of the industry in the realization of the AMBEO VR Mic right from the beginning. Thus, they developed a comprehensive product package including many well-conceived accessories that allow for a smooth workflow ¬– not least the A-B encoder software that works as a plugin, which can be seamless embedded in your post-production process. The AMBEO VR Mic works with ambisonics, a multi- channel technique that lets you spherically capture the sound arriving from all directions, at a single point in space. For playback this representation is rendered binaurally, allowing you to virtually rotate the orientation of the perspective in all directions, horizontally and vertically. Ambisonics is also supported by all of the major post-production and playback tools on the market today. This makes ambisonics the appropriate tool for Virtual Reality and all other applications involving 3D sound and interactively controlled audio. A tool to create new worlds of sound with. The capsules of the Sennheiser AMBEO VR Mic deliver A-format, a raw 4-channel output that has to be converted into a new set of 4 channels, the Ambisonics B-format. This is done by the specifically designed Sennheiser AMBEO A-B format converter plugin, which is available as free download for VST, AU and AAX format for your preferred Digital Audio Workstation for both PC and Mac. B-format is a W, X, Y, Z representation of the sound field around the microphone. W being the sum of all 4 capsules, whereas X, Y and Z are three virtual bi-directional microphone patterns representing front/back, left/right and up/down. Thus, any direction from the microphone can be auditioned by the listener during playback of Ambisonics B. With its history of 70 years as a trusted and innovative company, developing top-notch professional microphones with high-quality capsules, you are entitled to expect a lot from the Sennheiser brand: reliable, robust German-engineered products. Rest assured: Sennheiser deliver – and also provide excellent customer support as well as a 2-years warranty with every product.